Disclosure: This is a sponsored post written by me on behalf of Little Debbie®. As always, all opinions are my own. Like many parents, our mornings were often busy, challenging, and hectic. A few years ago, I asked my kids an important question that forever changed our daily morning routines. What can we do to make our mornings awesome? I was tired of feeling stressed out and always rushing! To my surprise, we were able to brainstorm a few EASY ways to connect as a family, and make the most of our morning time together. We still have crazy mornings once in awhile (who doesn’t?). But even on the days when we have trouble getting our act together, doing just one or two of these things makes me FEEL like we do. the kids lay out their clothes (including socks, shoes, and hairclips) for the next day. The morning is not the time to be rushing around the house searching for lost shoes or library books! Planning your intentions for the day can be an important part of the morning routine for kids and grown ups alike. To help with this, I developed an Agenda of Awesomeness that we use as a morning placemat. 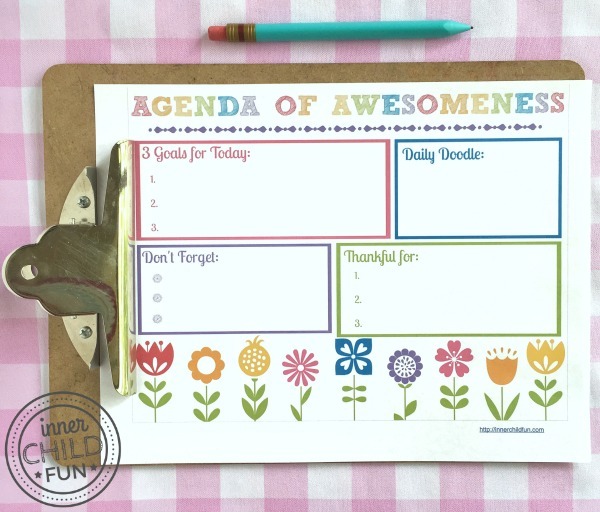 You can download and print out your own copies of the Agenda of Awesomeness below. For personal use only, please. These placemats are an easy way to keep track of your short term goals, count your blessings, and write out small reminders. My kids love the space for doodling too! If you are in a breakfast rut, starting the day with the same ol’ meal can get pretty boring. I am not much of a baker. 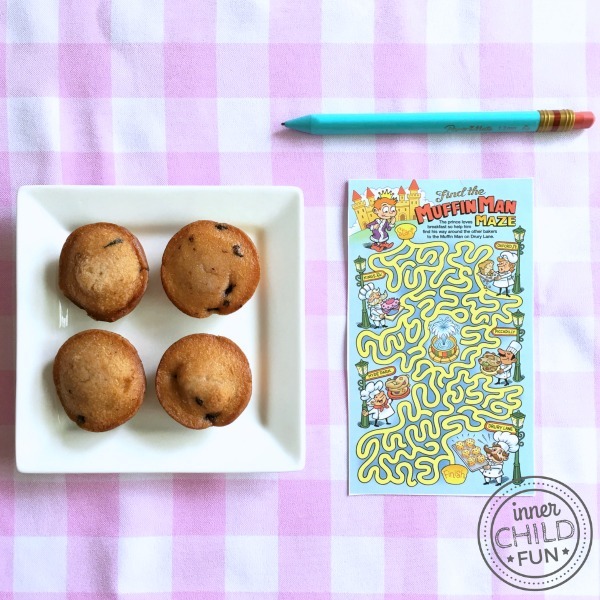 However, with the help of Little Debbie® Mini Muffins, the kids can enjoy a fun breakfast treat once in awhile that is quick, easy, and delicious! I love how something so little can make the kids so happy! 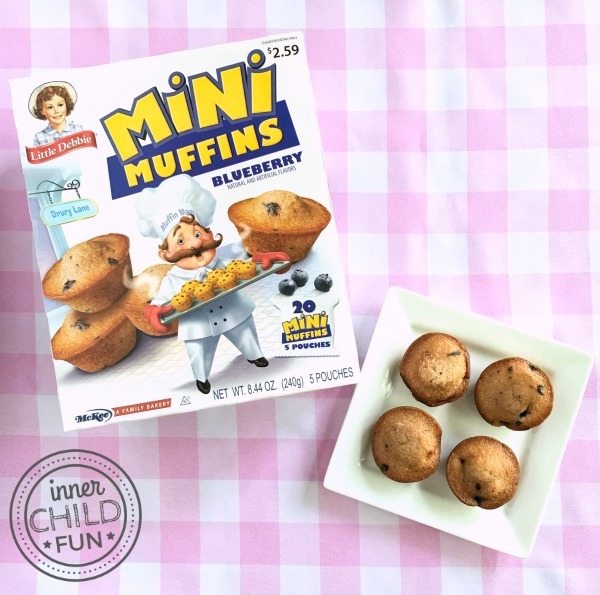 They come in handy packets that contain 4 Mini Muffins – perfect for even the busiest mornings when we are on-the-go. Some simple, mess-free play ideas can be a great way to connect with your kids in the morning. Some of our favorites are: card games, coloring books & colored pencils, mazes, activity books, and stickers. For more activity ideas, you can visit the Little Debbie® website! Even if you only have time for a few pages, reading to kids is so important. For tiny pockets of time, we love reading poetry. Some of our favorite poetry picture books are: When Green Becomes Tomatoes, Out of Wonder, and Where the Sidewalk Ends. If reading books is not possible, consider listening to audio books after having breakfast or while in the car commuting to school. Question — Do you have a favorite EASY way to make mornings awesome for your family? I would love to hear about it! Leave a comment and share your ideas with us! I love this post, Valerie! I couldn’t agree more about prepping the night before. And your placemat is fantastic – I’m downloading it for the boys now 🙂 Thanks!